Join me every week for Win-It Wednesday. I’ll be posting several 24-hour giveaways throughout the day to give you plenty of chances to win! My three-year-old daughter has been asking to see the “Chicken Mucks” movie since she first saw the trailers several months ago. I have fond memories of watching the Alvin and the Chipmunks cartoon on Saturday mornings when I was little, and of course I loved the Chipettes, so we were both thrilled when the Alvin and the Chipmunks: The Squeakquel arrived on our doorstep last week. The look on her face was priceless when I handed her the double DVD pack, and she insisted on watching it right away. Since my older boys were on Spring Break, we decided to hold a mid-day family movie session, and we had a blast. We’re getting to the stage in our family where it’s hard to find movies that will appeal to me and my husband, while still appealing to all of the kids, and this movie totally fits the bill. Sure Alvin and the Chipmunks: The Squeakquel can be a bit corny at times, but it has some great teachable moments, and the music will have you singing along — which coincidentally you’ll be able to do all. the. time. with “The Squeak Along” bonus disc. Ask me how I know, LOL. If you’re looking for a family-friendly film to share with your kids, this is a great choice! Plus you can continue the good times when you visit Fox Family Flicks for More Munk Mayhem . 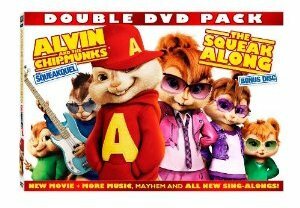 Alvin and the Chipmunks: The Squeakquel is available on DVD, Blu-ray and Digital Download so that you can buy it now, and three lucky Deal Seeking Mom readers will win the Double DVD Pack that includes “The Squeak Along” Bonus Disc! To enter, tell me if you were an Alvin and the Chipmunks fan back when you were a kid. 1. Leave a comment. Did you watch the original Alvin and the Chipmunks when you were a child? 3. Join the new Deal Seeking Mom Forums to chat about your great finds, special coupon codes, and chances to win exclusive giveaways. Come back and leave a separate comment letting me know you’ve joined or that you’re already a registered user! This giveaway ends at 9 a.m. EDT on Thursday, 4/8 and is open to all U.S. residents 18 years or older. I’ll use Comment Contest to select the winning comment. Winner will be notified by email and listed on my Giveaway Winners page. Winners must respond within 48 hours of notification to claim their prize. Good luck! I loved the original Alvin and Chipmunks. My kids and I just watched the Squeakquel and LOVED it! Really cute. We’d love to have it to add to our collection…. I also subscribe to your e-mail newsletter and LOVE that, too! Thanks for all that you do! I am a forums member. I use to watch the cartoons all the time growing up. Watched it, but my family had a record of their songs as well. Will never forget their voices! Thanks for the opportunity!